Cassava is a heavy feeder crop that can cause serious depletion to soil nutrient stocks. This research aimed to explore soil fertility status and nutrient supply capacity at different growth stages of cassava fields under combined application of organic manure and NPK fertilizers in two agroecologies of Zambia. Topsoil (0–20 cm) samples were collected from cassava fields treated with factorial combination of four levels of chicken manure (0, 1.4, 2.8, and 4.2 ton ha−1) and four levels of NPK (control, 50N-11P-41.5K, 100N-22P-83K, and 150N-33P-124.5P). The soils were sampled under the cassava canopy to determine soil pH, available phosphorus (AP), total nitrogen (TN), organic carbon (OC), cation exchange capacity (CEC), exchangeable bases and micronutrients (Fe, Cu, Mn, and Zn). The samples were collected before planting andafter establishment at 4, 8, and 12 months after planting (MAP). Manure application significantly (p < 0.05) increased soil pH, while the application of mineral fertilizer reduced soil pH at all the plant growth stages. Similarly, manure application and their interaction with mineral fertilizer increased OC and TN levels, especially at harvest. By contrast, OC and TN decreased with the application of mineral fertilizer. AP levels increased following the application of both fertilizers. In addition, manure application significantly increased soil Zn content from 0.69 mg kg−1 in the control to 3.54 mg kg−1 for the highest level of manure at harvest. The interaction between manure and NPK significantly affected Fe and Mn content in the soil. The results revealed that sole chicken manure application or its combination with mineral fertilizer improves soil nutrient status of cassava fields in Zambian condition. More than half of the rural Africans directly depend on crops that are grown locally in their surroundings. However, land and labor productivity are among the least compared to the rest of the world (Bationo et al. 2007). Smallholder farmers in Sub-Saharan Africa (SSA) apply inadequate amounts of nutrients to their farms, which results in overuses of the soil nutrient stocks by plants leading to gradual soil nutrient depletion and eventual soil degradation (Ayoola and Makinde 2014). As a result, per capita food production is declining in Africa, mainly in SSA, while it is increasing in the other world (Bationo et al. 2011). Because of this, the long term agricultural productivity in the continent is under threat as crop harvest suffer from continuous soil nutrient mining (Namoi et al. 2014). As in many counties of SSA, cassava (Manihot esculenta Crantz) is one of the mainfood staples in Zambia (Biratu et al. 2018; Ntawuruhunga et al. 2013). It is also an important income generating and food security crop in Africa (Carsky and Toukourou 2005). Cassava is drought resistant and less affected by adverse climatic conditions, hinting at an expected expansion in its production especially when climate change threatens crop production in Africa (Howeler et al. 2013). However, cassava is a heavy feeder crop that can cause serious soil degradation because of excess nutrient removal (Howeler 2011). It extracts huge amount of soil nutrients, mainly potassium, followed by nitrogen and phosphorus (Imas and John 2013; Pongsivapai et al. 2016). It is then believed that just by applying mineral fertilizer alone, 10 to 16 ton ha−1 of fresh cassava root yield increase is possible for smallholder African farmers (Hauser et al. 2014). Because of the large gap between the agronomic potential and the actual cassava yield at farmers’ field (Chianu et al. 2012), there is a huge need for increased fertilizer application in Zambia and/or in other parts of SSA. Cassava production is expected to increase globally because of its increasing demand in industrial production of bioenergy (bioethanol), animal feed (Pongsivapai et al. 2016) and quality starch (Anyanwu et al. 2015). This huge demand for cassava will not be met unless adequate fertilizer input (organic and/or mineral fertilizer) is used to boost its production (Osundare 2014). Mineral fertilizers are usually exact in their content and depends on types of nutrients supplied. It also releases nutrient elements faster into the soils with limited residual effect (Makinde and Agboola 2002). On the other hand, organic fertilizers can supply both macro and micro nutrients at the same time and slowly releasing nutrient elements over long period of time. Their long term effects include improvement in soil structure, soil water content and cation exchange capacity (Edet et al. 2013). With separate application of either types of fertilizer, it is difficult to utilize the immediate availability of plant nutrients from mineral fertilizers and long term benefits of organic fertilizers. Alternatively, combined application of these two types has been considered as effective management strategy (Fairhurst 2012). However, few fertilizer trials on cassava have been conducted in Africa (Carsky and Toukourou 2005) leading to limited understanding of soils under cassava field treated by the combination of organic and inorganic fertilizer. Furthermore, how combined use of organic and mineral fertilizers affect soil nutrient status across growth stages of cassava has been less understood. Therefore, this study aimed to: (1) understand the soil nutrient status across different cassava growth stages and (2) explore the short term soil fertility variation in cassava field streated by combined application of chicken manure and NPK fertilizers in Zambia. The experiment was carried out at two sites (Fig. 1). The first site was the Zambian Agricultural Research Institute (ZARI) Mansa Station, located at 28°56′33.4″E and 11°14′30.2″S in Mansa District of Luapula Province. The second was the Kabangwe Station of the International Institute of Tropical Agriculture (IITA), located at 28°18′26.9″E and 15°18′11.6″S at the outskirt of Lusaka in Chibombo District, Central Province of Zambia. 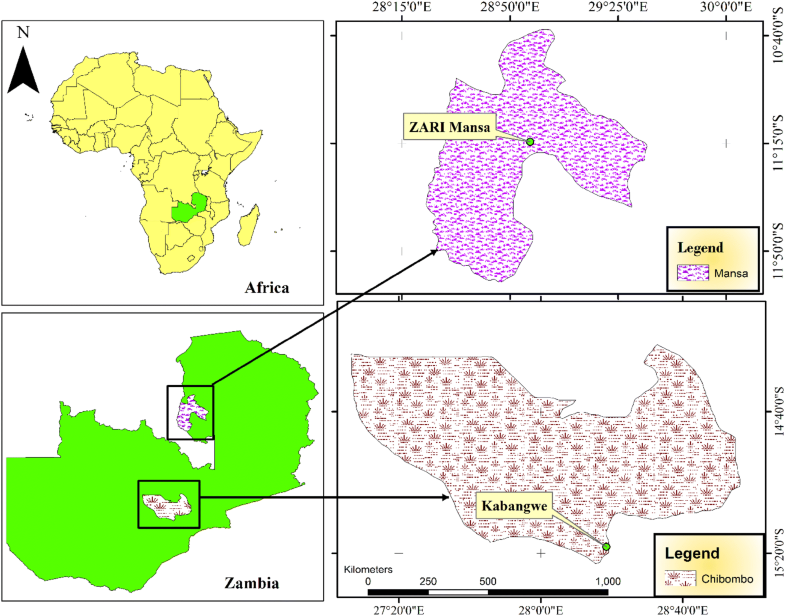 Mansa is in the agroecological zone III, while Kabangwe is situated in agroecological zone II of Zambia, which are divided based on rainfall and soil types (JAICAF 2008). Zone II is an area that receives an annual rainfall between 800 and 1000 mm, but the zone III is a high rainfall area receiving more than 1000 mm of rainfall per annum (Aregheore 2009). However, the 2015/2016 cropping season was an El Niño season in Zambia. This brought minimal rainfall in the central and southern part of the country, while the northern part still received appreciable amount of rain. As a result, from 23/11/2015 to 22/11/2016 the Kabangwe site recorded only 422.9 mm of rainfall, while Mansa recorded 1245.6 mm. The country as a whole is situated at the central African plateau and there is no significant difference (1246 m.a.s.l-ZARI Mansa and 1204 m.a.s.l-Kabangwe) in the elevation between the two research sites. According to the Zambian Environmental Management Authority-ZEMA (2013), Mansa district has a tropical continental climatic type, which is characterized by a cold dry season between May and July, hot and dry between August and October, and wet and dry between November and April. Gleysols dominate the soils of Mansa, but there are also acrisols and leptosols in some places. The soils of Mansa are generally leached because of the high rainfall in the area and with typical Miombo wood land vegetation. The dominant soil in the central plateau area is the Sandveld—where by the top soil is mostly dominated by sandy soil covering the clay sub-soil underneath with laterite (iron reach sub-surface horizon) (FAO 2008). In order to understand the soil nutrient status under the cassava plots, 4 × 4 factorial field experiment wasset in Randomized Complete Block Design (RCBD) with three replications at both sites. The treatments were four levels of chicken manure; the control (O0), 1.4-ton ha−1 (O1), 2.8-ton ha−1 (O2) and 4.2-ton ha−1 (O3), combined with four levels of NPK; control (M0), 50-11-41.5 kg N–P–K ha−1 (M1), 100-22-83 kg N–P–K ha−1 (M2), and 150-33-124.5 N–P–K kg ha−1 (M3) to give a total of 16 treatments. Chicken manure was chosen as soil amendment because it is high in nutrient content and readily available to smallholder households (Sileshi et al. 2017). We used 100-22-83 kg N–P–K ha−1 mineral fertilizer, which was recommended for cassava by Howeler et al. (2013) as a bench mark. We set two more levels by adding 50% and reducing 50% against the benchmark. The organic fertilizer (chicken manure) levels were set based on the nitrogen equivalent of these mineral fertilizer levels from lowest to the highest, respectively. Plot sizes were 5 m × 5 m and cassava was planted at a 1 m × 1 m standard inter and intra spacing, giving a total population of 25 plants per plot. Chicken manure (pure feces of chicken with no mixture of bedding material and feed) was freshly collected from caged, commercial layer farms, then properly dried and mixed to reach a homogenized mixture before application. Manure sample was also collected from properly mixed manure to determine its nutrient content for NPK and micronutrients. Seed bed was prepared by ploughing and harrowed using disc plows mounted on tractors. Matured improved cassava variety “Mweru” cuttings of 25–30 cm in length, collected from the ZARI research station in Mansa, were planted. The NPK fertilizer was band applied as a single source fertilizer in the form of urea, triple superphosphate and potassium sulfate, respectively. Following a conventional practice for cassava, the manure was applied once at planting, while the N and K were applied into two splits. Fifty percent of these nutrients was and applied at one MAP and the remaining 50% was applied at three MAP. P was all applied only once at one MAP. The trials were weeded by hand as needed. Topsoil samples (0–20 cm) were collected using an Edelman auger crisscrossing the experimental site and bulked together to get homogenized composite sample for each of the experimental sites before planting. After the establishment, samples were collected under the canopy of five cassava plants in the 3 m × 3 m net plots following an ‘X’ pattern and bulked together to give composite sample per plot. The sampling after establishment was done three times (at 4, 8 and 12 MAP) to get the soil nutrient condition at wet, dry, and at harvest seasons. After collection, samples were air-dried, ground, and pass through a 2 mm sieve to get the fine earth fraction (< 2 mm separates) and taken to the IITA’s soil laboratory in Cameroon for wet chemistry analysis. Soil pH-H2O (1:2.5 solution) was determined in a 1:2.5 (w/v) soil to water solution using pH meter, as outlined by McLean (1982). OC was determined by chromic acid digestion and spectrophotometric analysis as described by Heanes (1984). TN was determined from a wet acid digestion (Buondonno et al. 1995) and analyzed by colorimetric analysis (Anderson and Ingram 1993). Exchangeable bases (Ca2+, Mg2+, K+ and Na+) as well as available micronutrients (Cu, Zn, Mn, Fe) and AP were extracted using the Mehlich-3 procedure (Mehlich 1984), whereby the contents in the extracts were determined by flame photometry and atomic absorption spectrophotometry (AAS). Exchangeable acidity was extracted with 1 M KCl and quantified by titration. CEC was extracted using ammonium acetate method (van Reeuwijk 2002) in which the content was determined colorimetrically. The soil data collected were subjected to statistical analysis of variance (ANOVA) using general linear mixed model (GLMM) in R statistical software version 3.4.2 (R Core Team 2017). During the analysis, organic and mineral fertilizers were considered as fixed factor while site was considered as a random factor in the lme4 package of R (Bates et al. 2015). The statistical model had the following general form (Eq. 1). where: Tijk is the total observation, µ is the overall mean, Si is the site effect, Oj is the jth manure treatment effect, Mk is kth NPK fertilizer treatment effect, (OM)jk is the interaction between manure and fertilizer, and εijk is the variation due to random error. This model was fitted to detect the main effect and two-way interaction between organic and mineral fertilizer over the three different sampling times separately. When the ANOVA showed significant difference, the means were separated using lsmeans package of R (Lenth 2016) with the Honestly Significant Difference (HSD) set at a 5% level of significance. Table 1 presents results of soil analysis for the two research stations. In terms of physical properties, sandy texture dominates the soil particle size distribution (54–77%), with low levels of silt (7–20%) and clay (16–26%) at Mansa and Kabangwe stations, respectively. The sandy loam texture class at Mansa indicates alluvial and transported parent materials of the study site soils. The soil reaction of the two sites were 4.9 and 5.28 and the pH of manure was 7.48. Based on the rating according to (Hazelton and Murphy 2007), the soil reaction is rated very strongly acidic at Mansa and strongly acidic at Kabangwe, while the manure was slightly alkaline. In terms of nutrient supply capacity, the soils are very low in soil OC (1.0–1.2%) and TN (0.05–0.06%), and extremely low in CEC (3–4 cmol+kg−1) and basic cations (Ca2+, Mg2+, K+and Na+). The soil at Kabangwe is particularly deficient in AP (3.78 mg kg−1) when that of Mansa has excess levels of AP (20.51 mg kg−1). This may indicate natural variation and/or difference in previous land use that has resulted in residual phosphate accumulation in Mansa and depletion at Kabangwe. The low levels of nutrients and CEC is consistent with the low levels of clay and therefore limited surface area for nutrient and cation retention as result of sandy nature of the soils (Brady and Weil 2002; Elias 2016). The implication of this is that application of organic fertilizers and leaf litter is essential to retain nutrients and enhance the soil organic matter content. In light of this, the chicken manure can contribute favorable qualities including high contents of OC (26%) and organic matter (45%), high levels of nutrients including TN (3.6%) and CEC (26 cmol+ kg−1), cations such as Ca2+ (9 cmol+ kg−1) and K+ (2 cmol+ kg−1), and most micronutrients (Fe, Mn, Zn, Cu). The result therefore shows the potential of chicken manure as soil amendment to address the low levels of nutrients and organic matter in the soils. However, low levels of AP (1.3%) and high levels of Na (8 cmol+ kg−1) are the sources of concern suggesting the need for combining chicken manure with phosphate fertilizer to avoid salinity increases from large quantities of manure application. Except for the mineral fertilizer at four MAP, soil reaction (pH) was significantly (p < 0.05) affected by the application of both organic and mineral fertilizer. But no significant interaction effect was observed for soil pH across different cassava growth periods. Application of organic fertilizer on soil pH becomes more significant as time goes and it consistently and significantly improved pH level in the soil, especially at harvest (Table 2). On the other hand, the effect of mineral fertilizer application was significant from 8 MAP and increased fertilizer application significantly reduced the soil pH level over the control. For plots treated by organic manure, the highest pH (5.94) was recorded for the plots that received 4.2 ton ha−1 manure at harvest while the lowest (5.22) was recorded from the control at 8 MAP. In addition, pH reading was all high for the highest level of manure treatments across all the cassava growing periods with an increase of 9, 10, and 16.7% at 4, 8, and 12 MAP, respectively, compared to the control. For plots treated by mineral fertilizer, the highest mean pH (5.86) was recorded in the control plots at harvest while the lowest (5.32) was observed in the plots treated by 150-33-124.5 kg N–P–K kg ha−1 treatments at 8 MAP (Table 2). In general, increase in the application of mineral fertilizer resulted in lower soil pH across all the cassava growing periods. The highest level mineral fertilizer application resulted in 2.5, 7.7, and 7.5% reduction in soil pH level at 4, 8, and 12 MAP, respectively, compared to the control. 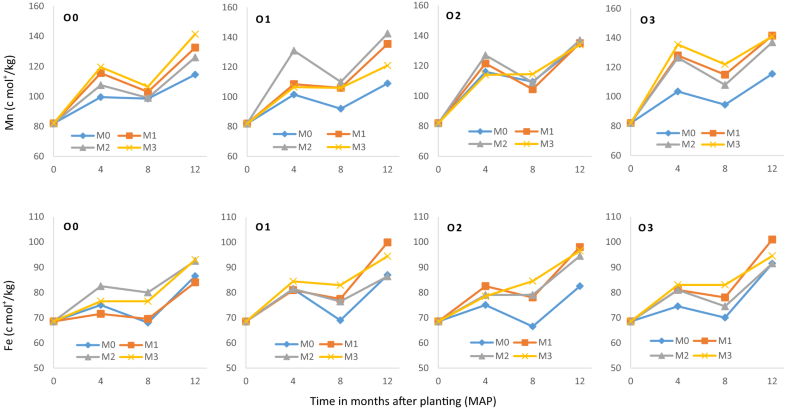 Except for the manure treatments at 8 MAP, soil OC was significantly (at least p < 0.05) affected by both organic and mineral fertilizer application to cassava fields across all the growing periods. On the other hand, the effect of TN was pronounced at harvest time. At harvest, both organic and mineral fertilization significantly (p < 0.05) influenced soil TN level. With the only exception at 8 MAP that showed higher but statistically non-significant effect, manure application resulted in significantly lower OC and TN under the control plots; but consistently increased with the increased application of chicken manure. However, for soils treated by mineral fertilizers, the highest mean TN was recorded from the control and the least was recorded from the M2 level of mineral fertilizer application during all the cassava growth period. While significant OC variation was observed across all the cassava growth periods, the mineral treatment effect on soil TN was observed at the harvest stage. 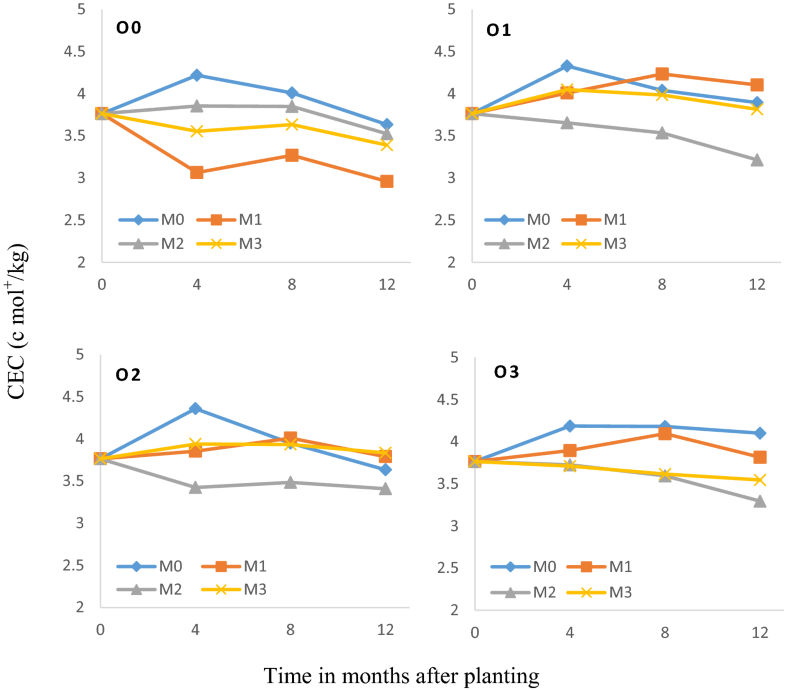 The highest mean OC level was again observed in the control plots for soils under mineral fertilizer, with M2 level application significantly reduced the soil OC during all the growth periods (Table 2). At 4 MAP, the interaction effect between the organic and mineral fertilizer was marginally significant for OC and non-significant for TN. At 8 MAP, it significantly affected the soil OC content, but no significant effect was detected on TN levels. At harvest, both OC and TN levels were significantly (p < 0.05) affected by the interaction between chicken manure and NPK application. The mean OC content (1.4%) was the highest at 4 and 12 MAP for the plots treated with 2.8 t manure and 50-11-4.15 kg N–P–K ha−1 (treatments O1 × M1), and the lowest (1.1%) was for plots received sole application of 150-33-124.5 kg N–P–K ha−1 (M3) at 12 MAP. On the other hand, highest level TN (0.08%) was recorded for the sole application of 4.2 t chicken manure ha−1 (O3 × M0) at 12 MAP (Fig. 2). Application of both organic and mineral fertilizer consistently and significantly (p < 0.05) increased AP with no significant interaction effect between them (Table 2). The mean AP was lower in the control and higher in the highest levels of both the manure and mineral fertilizer treatments across the different growth periods. Mean AP was the least in the control plot (35.26 mg kg−1) at 8 MAP, compared to the highest (155.8 mg kg−1) at harvest in the plots treated with 4.2 ton ha−1 chicken manure. On the other hand, for the plots treated by mineral fertilizer, the least AP was observed in the control plots (43.1 mg kg−1) at 4 MAP while it was the highest (123.6 mg kg−1) in M3 plots at harvest (Table 2). 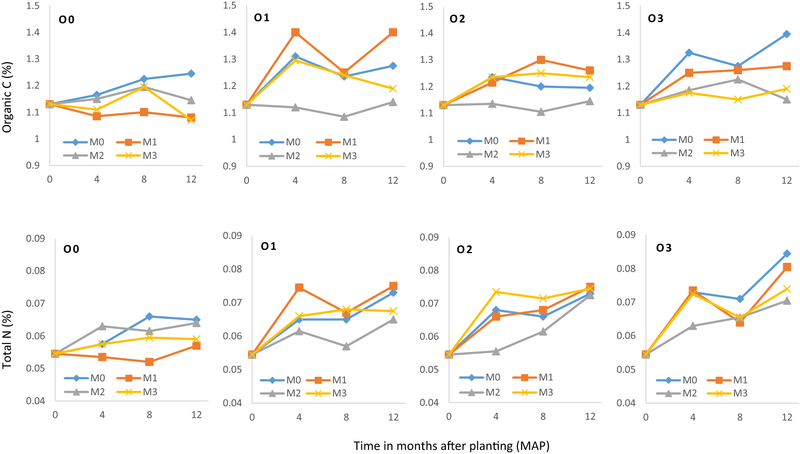 Exchangeable bases under the cassava plots were significantly (p < 0.05) affected by the application of organic fertilizer, with the exception of soil K+ level that was marginally significant only at 8 MAP. There was no effect of mineral fertilizer application on exchangeable bases at 4 MAP, except K+. But mineral fertilizer application significantly affected the level of soil exchangeable bases at 8 and 12 MAP, except Na+. No significant interaction effect was observed between organic and mineral fertilizer application on soil exchangeable bases. The application of organic and mineral fertilizers, and their interaction significantly (p < 0.05) affected CEC-soil during all the cassava growth periods (Table 3). Application of organic fertilizer consistently increased all the exchangeable bases over the control plots. The increased relation was statistically significant in plots that received 4.2 t manure ha−1 and at harvest (Table 3). The highest level (5.43, 1.28, 0.69, and 0.05 mg kg−1) of exchangeable bases: Ca2+, Mg2+, K+, and Na+, respectively were recorded from O3 treatments, all at 12 MAP. However, the least Ca2+ (2.01 mg kg−1)—at 8 MAP, Mg2+ (0.85 mg kg−1)—at 4 and 8 MAP, K+ (0.34 mg kg−1)—at 8 MAP, and Na+ (0.01 mg kg−1)—at 4 MAP were all recorded from the treatments without organic fertilizer (controls). 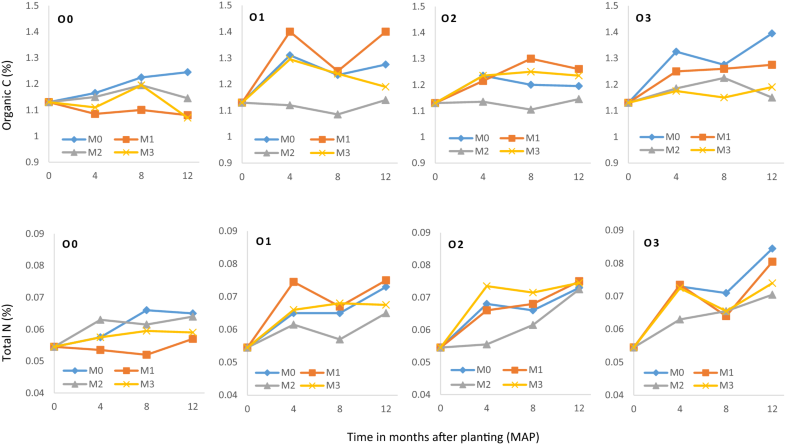 While mean Ca2+ and Mg2+ content in the soil were the highest in the control plots, they were the least for K+ and Na+ for soils treated by mineral fertilizer application. To be more specific, mineral fertilizer application significantly decreased Ca2+ and Mg2+ contents, especially at 8 and 12 MAP. While K+ significantly increased, the increase in exchangeable Na+ content was not statistically significant across all the growing periods under cassava fields in Zambia (Table 3). Cation exchange capacity (CEC) of the soil, on the other hand, significantly affected by organic, mineral fertilization and their interaction, with the only exception of manure application at 8 MAP. While CEC was significantly lower in the control, it was higher in plots treated by organic amendments with no significant variation between the different levels. However, it was significantly higher in the control plots at 4 MAP, significantly higher in the control compared to M2 at 8 and 12 MAP, and no significant difference between M1 and M3 levels for soils amended by mineral fertilizer. For the combined application, mean CEC was the least (2.96 cmol+ kg−1) under the plots treated by O0 × M1 at harvest while it was the highest (4.36 cmol+ kg−1) for plots treated by O2 × M0 at 4 MAP (Fig. 3). The application of organic fertilizer either marginally or significantly (p < 0.05) affected soil Zn and Mn content, but no significant effect on Cu and Fe was observed. The application of mineral fertilizer however, significantly (p < 0.05) influenced soil Cu and Mn content at 4 MAP, Mn and Fe content at 8 MAP and all micronutrients except Zn at harvest. Application of chicken manure consistently and significantly improved Zn content throughout the cassava growth period. However, Zn content was the lowest in plots that received 100-22-83 kg N–P–K ha−1 during all the cassava growing periods, the lowest being at 8 MAP (Table 4). In addition, organic fertilizer application improved soil Cu content with no significant difference observed between plots treated by different levels of organic fertilizer and the control at the different growth stages. However, application of mineral fertilizer significantly reduced soil Cu content with the highest mean Cu content observed in the control plots compared to M3 at 4 MAP; M2 and M3 at 12 MAP. Though the Cu level consistently declined with the application of more mineral fertilizer, no significant difference was observed between the different levels at 8 MAP. On the other hand, an increase in the application of manure consistently increased soil Mn content across all the growing season. But, the increase was statistically significant only at 4 MAP. At this stage of the cassava growth, O3 level of manure resulted in significantly highest (114.7 mg kg−1) Mn content compared to the control plots, but no significant difference was observed with the other manure levels (Table 4). Application of mineral fertilizer resulted in significantly lower Mn content in the control plots compared to those plots that received the different levels of fertilizer treatments. However, no significant variation was observed among the other levels of mineral fertilizer. On the other hand, the application of organic fertilizer improved soil Fe content during all the growth periods. But, no significant difference was observed between the different manure levels and the control. Conversely, starting from 8 MAP, the application of mineral fertilizer significantly improved soil Fe content compared to the control, but no significant variation was observed between the different fertilizer levels. The interaction effect of organic and mineral fertilizer was only marginally significant for Fe at 12 MAP and significant (p < 0.05) for Mn at 4 and 12 MAP. The highest (142.5 mg kg−1) mean Mn level in the soil was recorded by the combined application of O1 × M2 at harvest while the lowest was from plots treated by O1 × M0 at 8 MAP. The highest soil Fe level (101 mg kg−1) was observed in the plots treated with O3 × M1 at harvest while the lowest mean (66.5 mg kg−1) was observed from the plots treated with O2 × M1 at 8 MAP (Fig. 4). The intensification effort of crop-based agriculture in every corner of the world has been followed by an increase in the use of chemical fertilizer (Morris et al. 2007). However, the consequence of this fertilizer use must be understood to take corrective measure for the sustainable production of crops in Africa in general and in Zambia in particular. In this research the use of organic fertilizer increased pH level in the soil, while the opposite happened with the use of mineral fertilizer application to cassava fields. Different outcomes were reported by different researchers regarding the application of fertilizer on cassava fields. For example, Makinde and Agboola (2002) reported a decline in soil pH level when cassava was fertilized either by organic or by mineral fertilizer. However, others reported the use of organic fertilizer (chicken manure) significantly increased soil pH level of cassava fields but the use of mineral fertilizer decreased it (Bodruzzaman 2010; Rós et al. 2013). The increase in soil pH following the application of organic fertilizer was attributed to different causes such as oxidation of organic acids, ammonification of N, reduction reactions created by anaerobiosis, and adsorption of organic molecules during the decomposition of organic fertilizer (Haynes and Mokolobate 2001). Though most crops grow between 5.5 to 6.5 pH, reduction below this level of soil pH as a result of mineral fertilizer application is not a problem for cassava growers, because cassava belongs to the most tolerant crops to low pH level in the soil (Islam et al. 1980). The application of organic, mineral fertilizer and their interaction also resulted in significant variation in soil TN and OC. While both nutrients increased following the application of organic manure, they declined with the application of mineral fertilizer. The increase in the soil TN and OC following the fertilization of cassava with organic fertilizer was reported earlier (Amanullah et al. 2007; Howeler 2001) and our finding also corroborate with these previous results. The increase in TN and OC was because of the triple effect of organic matter from the organic fertilizers: net source of carbon and nutrients, increase in cation exchange capacity and stimulation of the biological communities in the soil (Salami and Sangoyomi 2013). Of course, the quality of the organic material, mainly the C:N, matters for these to happen since high C:N ratio (roughly ≥ 30/1) can result in immobilization of N that can last from short to longer period, depending on the temperature of the area and the moisture content of the soil (Bakayoko et al. 2009). In our case, the chicken manure we used has low C:N (7.86) that is not a problem in this regard. However, care has to be given to the amount of manure applied as it depends on the manure quality, nutrient availability in the soil, the crop demand and the environmental conditions (Eghball et al. 2002). Fifty to hundred percent productivity increment is expected from the use of mineral fertilizer (Chianu et al. 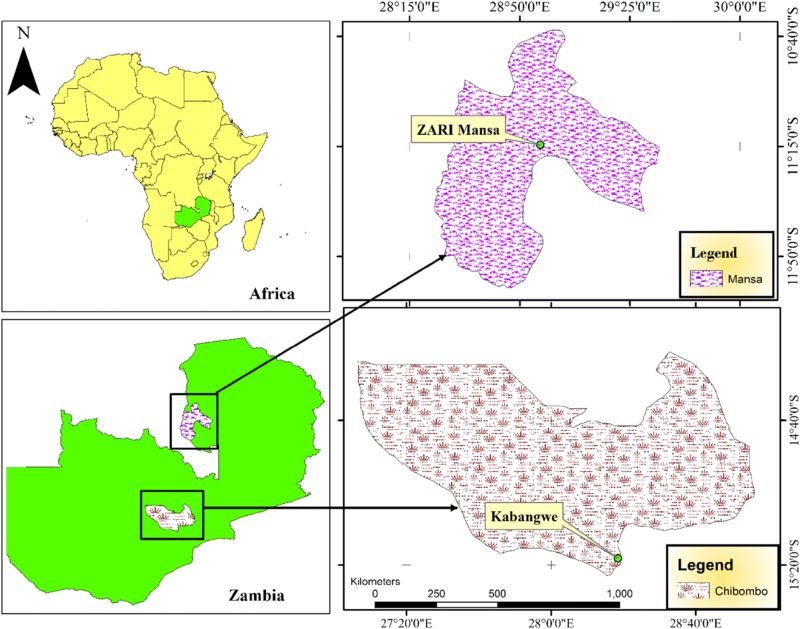 2012) and about half the biomass of matured cassava plant is its roots (Hauser et al. 2014). Cassava is known as heavy feeder that can remove significant amount of plant nutrients with the root harvest (Osundare 2014). Contrary to animal manure that contain variable nutrient contents (Howeler 2001), which can provide plant nutrients gradually for several years (Eghball et al. 2002), mineral fertilizers contain fixed amount of nutrients that can be released within short period of time. Because it is readily available, it can easily be up taken by the plant, volatile or leached. This may be the reason why mineral fertilizer application resulted in low level of TN in the soil, especially at harvest time. The low level of soil OC from the application of mineral fertilizer may be because of the fact that synthetic fertilizer application, especially mineral N, favors the growth of soil microorganisms that consume C than those that can build it (Leu 2007). The application of both organic and mineral fertilizer resulted in the increase of AP in the soil with no significant interaction effect between them. Organic manures mostly supply P and micronutrients (Makinde and Agboola 2002) and more than 70% of the P in animal manure is plant available in its inorganic form (Eghball et al. 2002). By contrast, cassava is efficient in P extraction from the soil because of the symbiotic association between its roots and Vascular-Arbuscular mycorrhiza (Howeler 2001) that can minimizes P depletion. As a result, both application of organic and mineral fertilizer resulted in increased soil AP under the cassava fields. Numerous researches on soil fertility in cassava reported that cassava extracts more exchangeable K compared to other crops (Fernandes et al. 2017; Howeler 2002; Howeler et al. 2013; Osundare 2014). Irrespective of the ability of manure to supply exchangeable bases (especially Ca2+, Mg2+, and K+) and the nearly 100% availability of K from manure (Eghball et al. 2002), the increase in soil K between the different levels of manure was non-significant in this research. To the opposite, the application of organic manure significantly increased other exchangeable cations in the soil. This may be considered as the confirmation of the high K demand of cassava from this research also. K is the most limiting factor in cassava system (Ezui 2017), and it was also found that for every single tone of cassava root harvested 2.3, 0.4, and 3.0 kg of nitrogen, phosphorous and potassium is removed from the soil (Hauser et al. 2014). This shows that K is not only essential, but it is leading the amount of nutrients removed by cassava roots. The application of mineral fertilizer, on the other hand, significantly improved soil exchangeable K, but significantly reduced the other exchangeable bases. This may be because we applied mineral fertilizer K, but not the other nutrients. Besides to this, the application of chicken manure also improved the CEC of the soil in Zambia. This corroborates what Bakayoko et al. (2009) found in west Africa. A recent review on secondary and micronutrients study in SSA indicated that regardless of their importance in increasing productivity, secondary and micronutrients were rarely studied; with macronutrients getting the most attention (Kihara et al. 2017). The review also indicated that application of S and micronutrients increased maze yield by 25% and its agronomic efficiency improvement varied between 38 and 432 kg kg−1 compared to the use of macronutrients alone. Though, micronutrient deficiency reports from cassava fields are very few, B, Cu, Fe, and Mn, deficiencies were reported from calcareous soils with high pH level, while Zn deficiency were reported both under acidic and alkaline soils (Howeler 2011). However, because of the fact that micronutrients deficiency and disease symptoms are most of the time similar, it is hard to detect micronutrients deficiencies in cassava fields (Hauser et al. 2014). In this research, the application of chicken manure improved all the micronutrient status in the soil, with significant improvement observed for Zn content in the soil. To the opposite, while Zn and Cu content in the soil declined, soil Mn and Fe content significantly improved with the application of mineral fertilizer, mainly at 8 and 12 MAP. A research from Malesia revealed that Cu was found to be the most limiting micronutrient for cassava production (Chew et al. 2008). In this research, the Cu released to the soil was statistically not significant following manure application—where we expect Cu release to the soil, while it was significantly reduced for the soils treated by NPK fertilizer—where we did not applied Cu. This may indicate that Cu is still important micronutrient for cassava production from this research too. It was evidenced that in an integrated system that uses both organic and mineral fertilizer, the soil nutrient level improves to support more crops sustainably. In this research, chicken manure application and its combination with mineral fertilizer improved the soil nutrient condition than mineral fertilizer application in most cases. While soil pH level improved with the application of manure, it declined with the application of mineral fertilizer application. In similar fashion, OC and TN increased with the application of manure. But, they declined with the application of mineral fertilizer. However, their combination improved both OC and TN, especially at harvest time. Manure application appreciably improved the soil Zn content, but soil Cu level declines with the application of mineral fertilizer to cassava fields. Therefore, it is concluded from this research that either sole manure application or its combination with mineral fertilizer improves the soil nutrient status in cassava fields. GKB conceived, designed, collected the data, analyzed and wrote the manuscript. EE and PN supervised the inception, design and edited the manuscript. PN facilitated the logistics and supervised the data collection process in Zambia. All authors read and approved the final manuscript. The authors would like to thank IITA’s Support to Agricultural Research for Development of Strategic Crops in Africa (SARD-SC) project for funding this research and Zambian Agricultural Research Institute (ZARI) Mansa staff and officials for their cooperation during the whole study period and for allowing us to use their farm plots. We thank also Dr. Tesfaye Shiferaw Sida for his comment and edition of this manuscript. The data used in this paper is with the authors and can be available upon demand. This research was funded by SARD-SC cassava project of IITA.